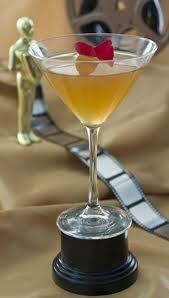 Get Your ‘Oscar’ Worthy Cocktails Right Here! These films are already winners this awards season and are sure to pick up more trophies at the Oscars on February 27. In celebration of this year’s Academy Awards Bombay Sapphire, Benedictine Liqueur, Dewar’s and Cointreau have teamed up to put together a few signature cocktails inspired by this year’s hottest films – also Dewar’s and Bombay Sapphire have been sponsoring a lot of the dinners and lunches for these stars and films leading up to the Oscars so they have definitely been sipped by all the A-listers. They’re perfect for serving during your Oscar viewing party! Raise your glass to Colin Firth’s Golden Globe and SAG victories with this decidedly British cocktail. Made with Earl Grey tea and Bombay Sapphire, the quintessential London Dry Gin, this cocktail is worthy of a King. Combine gin, tea infused simple syrup and lemon juice in a shaker over ice, shake vigorously. Double strain into a tea cup. Beat espuma mix until thick and foamy, spoon into tea cup, on top of Sapphire mixture. Put a pinch of tea leaves in center, garnish with a stick of orange bitters rock candy on the side of the tea saucer. Created by Boston mixologist Scott Marshall of Drink, this coffee-infused Benedictine cocktail is the perfect drink to fuel those long nights spent hacking into the Harvard computer network. Build in a cocktail shaker. Add ice and stir. Double strain into a chilled cocktail glass. Garnish with a lemon twist. Toast to two knock-out performances from Christian Bale and Mark Wahlberg, in this year’s “The Fighter” with a Dewar’s 12 cocktail that packs a punch, yet evokes passion. Watch as the film dukes it out for Oscar gold. Pour all ingredients into a cocktail shaker filled with ice. Shake vigorously and strain into a chilled glass. Garnish with a lemon twist. In one of the best performances of the year, toast Natalie Portman’s startling character portrayal in this psychological thriller. Follow her swirl of brilliance and insanity from White Swan to Black Swan, while drinking cocktails to match. Begin with the White Lady in its classic and purest form and end with the dark and deliciously menacing Cointreau Noir in Black Ice.